Let’s be frank. Compared to fMRI, NIRS has a number of intrinsic weaknesses. The signal to noise ratio is lower, the spatial resolution is (10x) lower, it can’t measure the deep brain, and it only covers a portion of the brain surface. As a result, fMRI, when possible, is still the preferred method to elucidate brain mechanisms. So if we do use NIRS, we’d better do experiments fMRI can’t, or at least very difficult to, do. In most fMRI settings the temporal resolution of BOLD signal is low (about 2 seconds, or 0.5Hz). That means we only get a number every two seconds. If we want to know the rise and fall of the BOLD signal in much higher temporal resolution, e.g. 10Hz, then NIRS would be a good choice. If you ever participate in a fMRI study, you will feel the room far from friendly. The scanner is loud, and it looks scary. During the entire experiment, you are lonely inside the confined space. You can’t move, can’t talk (for most experiments), and feel guilty when you swallow saliva as the experimenter probably told you in advance that any motion might distort the signal. What you often see is much simple visuals (such as blocks and circles) on a computer screen. Do we live such a life in reality? On the contrary, NIRS is small, even portable, and can be used in a naturalistic environment. You might see other people’s face on a screen in fMRI, but with NIRS, you can see a real face. We humans are fundamentally social, and to study social behavior in a naturalistic environment is important. 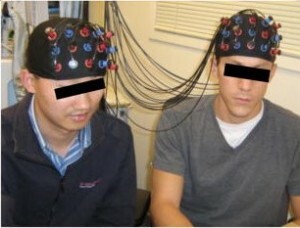 NIRS allows you to study face-to-face gaming (video or board), talking, brain storming, cooperation or competition, etc. For example, in one of our studies (https://www.ncbi.nlm.nih.gov/pmc/articles/PMC3254802/) participants played a video game together. my colleague Ning Liu et al has an experiment when two people play Jenga games (https://www.ncbi.nlm.nih.gov/pmc/articles/PMC4782164/). fMRI can be used in hyperscanning studies, and in fact the first hyperscanning is done with fMRI by my former advisor Dr Montague (https://www.ncbi.nlm.nih.gov/pubmed/12202103). However, seeing it with first hand, I know hyperscanning with fMRI is technically challenging. You need two fMRI scanners, each costs a few million dollars; and you also need to synchronize them. On the other hand, many NIRS devices are able to do hyperscanning natually. For example, when we used ETG 4000, we simply use one patch on one participant and the other on another participant. It does not add complexity on the hardware part. To date there are a number of hyperscanning studies with NIRS. For a list, please refer to https://www.ncbi.nlm.nih.gov/pubmed/?term=(fnirs+OR+nirs)+hyperscanning. If you are patient enough to scroll to the last page, you will find our paper! You can’t carry an fMRI scanner around for sure, but with NIRS’ portability, you can collect neural data in the field. My colleague Dr Baker took a NIRS device to the rural places in Costa Rica, and scanned the local farmers. Check out his paper. In addition, since you may carry NIRS devices around, you can scan a lot of participants, e.g. a few hundred or even thousand. 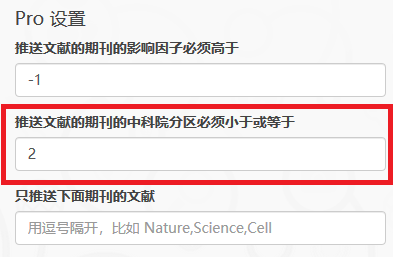 Imagine you are to study the brain and cognitive development of children in rural areas in China in a large scale (say 10,000 participants), then NIRS will become your top choice. In addition to this list, fMRI is also not friendly to infants (but still can be done in fMRI). In contrast, NIRS does not have issues with the participants in the list. Imagine you can do an experiment on claustrophobia with NIRS, but probably not with fMRI. So, what is the ideal experiment with NIRS? Based on the above list, if one is to use hyperscanning to study the face-to-face communication when two claustrophobia participants are running together along a mountain trail, I would say it’s pretty hard for fMRI to catch on. Back in 2009, When I got my first MacBook Pro I was excited. It had the best configuration at that time (8G memory and 250G storage - SSD!). I still use it today. As I am developing Stork’s mobile app, I need to use the latest xcode. But Apple does not allow me to upgrade to its latest OSX, apparently my computer is too old. If you need to play with Mac OSX but do not own a Mac computer, you might wish you could install Mac OSX on your Windows 10 computer as a virtual machine. Luckily I found this useful webpage with detailed instructions on how to do it. The link also provides a download link of the macOS Mojave image file. With the instruction I was able to run Mac OSX Mojave successfully on my Windows 10 via VirtualBox. In the beginning the mouse/keyboard does not work, so I followed another link: https://techsviewer.com/how-to-install-virtualbox-extension-pack-and-enable-usb-3-0/ which solved the problem. During Mac OSX setup I also encountered the apple ID login issue. In the end I did not sign in my apple ID during the setup phase - I created a local account instead. Good news for brain imaging researchers. There is a new dataset available for you to play with. BOLD5000 is a large-scale, slow event-related fMRI dataset collected on 4 subjects, each observing 5,254 images over 15 scanning sessions. The images are selected from three computer vision datasets. I want to show a list of my own publications on my webpage, is there an easy way to do so? Yes, Stork API, a single line of code, allows you to show a list of publications given a keyword. You only need to put the code to your webpage once, and then even if there are new publications, the list will update itself. What about a list of publications in fNIRS field? It’s easy too. As you can see, all you need to change the the “k” parameter (which stands for keyword). 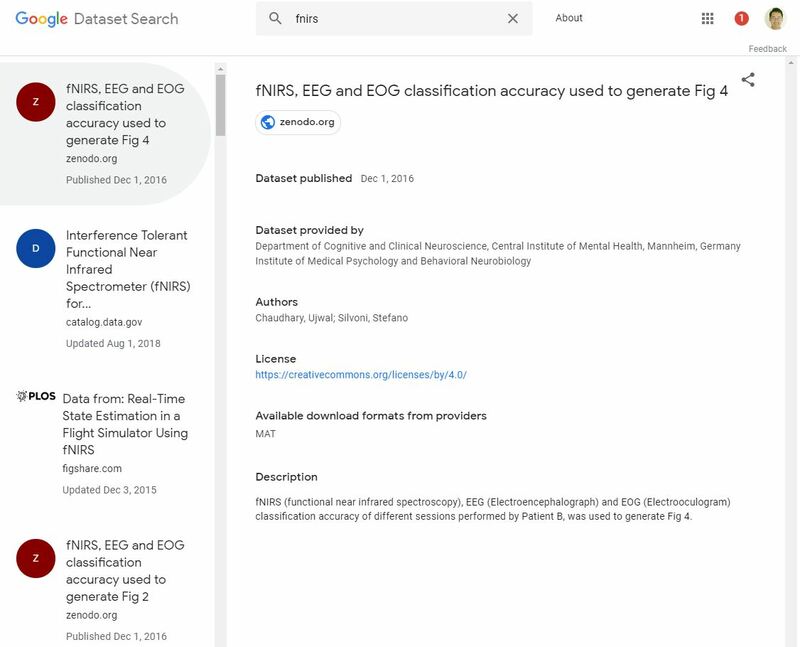 Google Dataset search, a great tool for fNIRS and fMRI? I searched ‘fNIRS’ and it returned 30+ results. See figure below. I clicked the first one, fNIRS/EEG/EOG classification, and it shows some meta information (e.g. the source and authors). Then I clicked the ‘zenodo.org’ website and did see the download link of the MAT file. I also tried to search ‘fMRI’. The number of datasets for fMRI is much larger than that for fNIRS. Currently the number of datasets indexed by Google is still limited, but I expect it will grow rapidly and become a very useful tool for scientists and anybody who want to play with data. fNIRS 2010 conference will be held during October 5-8, 2018 in Tokyo, Japan. You may find more information at http://fnirs2018.org/. The early registration deadline is 2018-09-05.